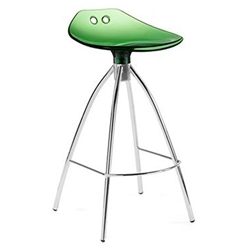 Modern and Stylish Italian made stool for Indoor use only. Solid White, Transparent Clear, Smoke, Green and Red. Indent Only: Available on Indent order only aperox 10 weeks. Fixed height and non swivel.